When it comes to replacement tires, we’re your #1 source for forklift tires, scissor lift tires, boom lift tires, solid pneumatic tires and more are in stock at our facilities throughout Illinois and Wisconsin. Improve forklift operation, fuel efficiency, and operator comfort by selecting the right industrial tire for your application. Learn more about why forklift tires fail. Not sure how to select the right tire for your needs? Contact us today and we’ll help you select the right tire for long term use. Below you’ll find a list of our most frequently purchased types of industrial tires and the numerous manufacturer’s that we stock. Need us to come to you? 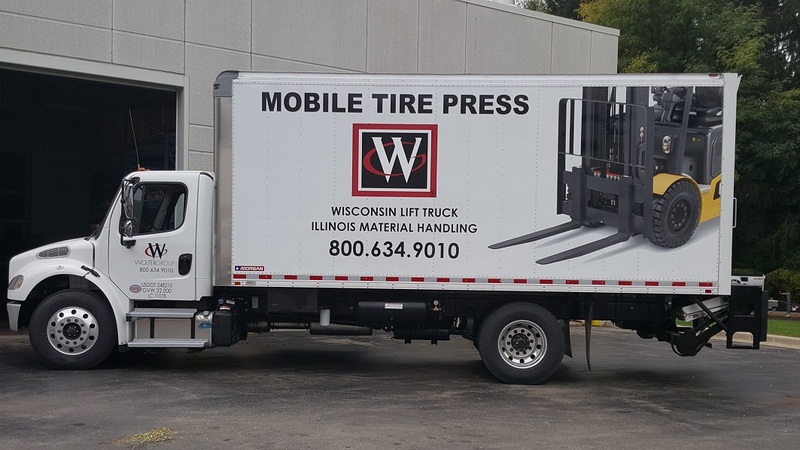 Schedule our mobile tire press service today! We can press your forklift or other industrial equipment tires at your location quickly. We’re all about speed and accuracy… it only takes about an hour onsite to complete the job. Schedule a tire press truck to come out today! Take advantage of our 2018 tire special!